Jazz fans seem to feel most strongly about two styles of jazz: smooth and free. Smooth is scorned as wallpaper music. Free divides listeners into two camps: those who like it and those who don't. Free jazz, a.k.a. avant garde jazz, is the topic of this week's Jazz 101 class at MacPhail with Kelly Rossum. There's a lot of animated discussion, and Kelly plays several examples that are interesting to some of us, noise to others. We talk about how most music has a purpose or function: relaxation, celebration, mourning (funeral music), dance, love. The function of avant garde jazz is music. Sometimes the point is internal dialogue. There usually is an intent. Kelly notes that "the presentation has more validity if the intent is true." And: "If art has no fringes, there is no center." People who like most other styles of jazz dislike avant garde because it lacks the historical elements they're accustomed to hear (form, rhythm, references...evolutionary fingerprints? ), it lacks familiarity, and it lacks melody. 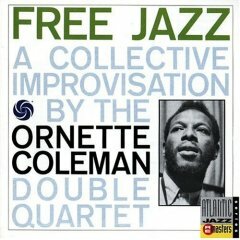 We hear part of the title track from Free Jazz by the Ornette Coleman Double Quartet: one quartet for each stereo channel. Ornette (sax), Don Cherry (trumpet), Scott LaFaro (bass), and Billy Higgins (drums) on the left; Freddie Hubbard (trumpet), Eric Dolphy (bass clarinet), Charlie Haden (bass), and Ed Blackwell (drums) on the right. (I can't wait to hear it that way, provided the CD still separates the tracks.) From there we move to one of Kelly's favorite recordings: the Naked Lunch soundtrack composed by Howard Shore. Ornette's saxophone wails over the London Philharmonic Orchestra. "The palette of sounds, the definition of vocabulary, has changed," Kelly says. "The center has moved." Then it's off to Miles Davis's Sorcerer, and finally Fat Kid Wednesday's new Singles. This is music Kelly clearly loves. "It's what jazz is supposed to be—people hanging around playing music." Fat Kid is a so-called local group, meaning they live here. But they play all over and recently returned from a stay in France. All three members—Michael Lewis on saxophone, Adam Linz on bass, J.T. Bates on drums—play with other people. We'll hear Linz with George Cartwright on Thursday, and Lewis with Bryan Nichols at Cafe Maude on Friday. See Fat Kid Wednesdays on MySpace.